The aim and objectives of the HLO / HERTL Training Programme are to equip the delegate with the initial knowledge, understanding and skills required to perform the role of Offshore Helicopter Landing Officer (HLO) safely and effectively. HLO's to understand the importance of pre-planning for and the main elements of the response requirement for a range of helideck and helicopter emergencies. Understand how the limited emergency response capability on an NUI can affect NUI helideck emergency response. The roles and responsibilities of both the HLO and the Helideck Emergency Response Team during a helicopter-related emergency. The target group for Offshore HLO / HERTL programme is personnel who are to be appointed to the role of an Offshore Helicopter Landing Officer. 6. 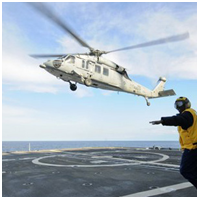 Understand meteorological requirements for offshore helicopter operations. 7. 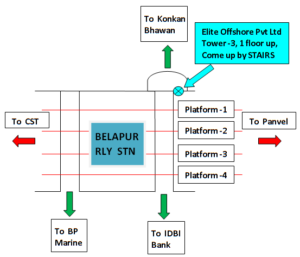 Define the role and explain key responsibilities of the offshore HLO. 9. Understand the structure and terms in a typical pre-flight weather report and floating installation (or vessel) data required by helicopter pilot. 10. Understand how dangerous goods are identified, packaged and labelled according to IATA and ICAO regulations, to include ‘Notification to Captain’ requirement. 11. Understand typical HLO requirements for Normally Unattended Installations (NUIs). 12. Conduct radio checks and use standard radio communications protocols when communicating with relevant personnel, to include HLO-to-helicopter pilot communications. 13. Use correct and appropriate hand signals if radio communications are ineffective. 14. Check the helideck for contamination, debris or damage after take-off. 15. Brief HDAs prior to helicopter landing at appropriate times during helicopter operations. 16. Ensure HDAs are in required locations during helicopter operations. 17. Conduct and respond to required helideck protocols during helicopter operations, to include: safe-to-approach, helicopter anti-collision lights switched off and ‘thumbs-up’ from pilot (as agreed by operating company). 18. Check passenger and freight manifests. 1. Define the role and key responsibilities of an HLO HERTL. 2. State the main elements of helideck emergency response plan. 3. Identify typical organisations involved in a helicopter emergency response. 4. Identify types of potential offshore helideck emergencies. 5. State the general firefighting safety goals and objectives. 6. Explain the purpose of typical helideck emergency systems and controls. 7. Explain the main differences between helideck emergency response on a main fixed or floating installation and a normally unattended installation (NUI). 8. Define the key role of the HLO. 9. Communicate effectively with relevant emergency response personnel. 10. Lead the helideck emergency response team in a clear and confident manner. 11. When safe to do so, direct the HERT members to the incident area – continually assessing how the changes in the emergency could impact on the safety of the HERT members – dynamic risk assessment. 12. Give clear and concise instructions to HERT members during the emergency. 13. Effectively monitor BA control. 14. Control firefighting operations effectively. 15. Control the HERT during non-fire helideck incidents. 16. Utilise the ER back-up team via the Team Leader – as required. 17. Effectively manage missing persons and casualties during the emergency. 18. Look for and respond accordingly to signs of stress in individual HERT members during the emergency. 5. When safe to do so, direct the HERT members to the incident area – continually assessing how the changes in the emergency could impact on the safety of the HERT members – dynamic risk assessment. 11. Effectively manage missing persons and casualties during the emergency. 12. Look for and respond accordingly to signs of stress in individual HERT members during the emergency.